NGOs are recently frustrated over pastoralist non-compliance in selling animals to cull their herds during the current drought in the central and eastern Sahel. From the NGO perspective, they are empowering pastoralists through allowing a market where herders can receive the needed cash to buy essential grains. NGOs are attempting to buy sheep and goats for 20,000 F CFA (~ 40 USD) each and cattle for 75, 000 F CFA (~150 USD) each as reported from IRIN News (see http://www.irinnews.org/Report.aspx?ReportID=90566 ).These figures, if reported accurately, are not the average prices for these animals and may be contributing to the difficulties experienced by NGOs. The money being offered for sheep and goats is 150 to 200% the average price during non-drought periods. Sheep and goats are commonly owned by women and lower castes in pastoral societies. By contrast, the price being offered for cattle which men of noble standing own is 50% the average price. This may be an attempt by NGOs to empower those more vulnerable in this crisis, but it may also contribute to gender and societal conflicts within these societies. There are, however, other forces with political roots working against a healthy relation between NGOs and pastoralists. NGO administrations as well as other key policy makers have notions of the Sahel as a ‘fragile ecosystem’ and, that social and ethnic customs encourage the overstocking of flocks. NGOs are certainly well-intentioned in terms of their goals of poverty alleviation and the proper stewardship of natural resources, but their misunderstanding and misinterpretation of pastoral actions is nothing new. They are repeating the same discourse of colonial and post-colonial agents who used these arguments to impose their power and jurisdiction over natural resources upon local populations in the past. It is tragic that they are reverting to these old doctrines while a crisis unfolds as there is a need to take action to save lives and peoples’ livelihoods. Pastoralists, in response to the NGO presence, have shown and continue to show a considerable amount of resistance to outside interference. They have seen outsiders come to their encampments before, and expect them to leave in the immediate future. At the risk of over-generalizing the gravity of the current situation in the Sahel, I would like to provide some insight from my own research regarding why pastoralists maintain their herd sizes, even at the risk of losing most if not all their animals. They have coped with crises before and while the situation is bad in places like Tombouctou and Gao for the moment, herders in these regions have experienced worse and are dealing appropriately to seasonal variability. Some parts of the Sahara and Sahel experienced insufficient rains but other areas are now receiving ample rainfall and many pastoralists are migrating to these locations. This involves more work, greater distances to travel and with some families sending a member to the urban areas for wage labor or other income generating activities. Holding onto their animals is both a means of socioeconomic security and an act of cultural and familial stability. Pastoralists prefer to maintain their flocks more so than reduce them during periods of stress. NGOs may have their own ideas as to what number is a ‘healthy stock number’ but they are not generally reporting these figures unless there is a crisis like drought or disease. Animals die in both good and bad periods, but pastoralists are more likely to cull during a good season when their flocks are not endangered. Pastoralists, of course, have concerns of losing animals without any returns. If they are struggling with a flock size that is already reduced like what is happening in northern Mali at present, however, pastoralists prefer to maintain their animals instead of selling them. This is because of near future concerns like losing what remains of their flocks when ‘non-drought’ incidents like accidents, disease or theft strike their encampments. Other factors contributing to pastoral abstinence to culling is experiences pastoralists have had with NGOs in the past. The record with NGOs is not stellar as aid that came in the 1970s drought-famine was riddled with mismanagement, favoritism, and corruption working to government employees’ favor. Aid in the 1980s drought-famine saw adjustments and improvements in management but difficulties still existed. The distribution was riddled with high transportation costs and rarely arrived to numbers greatly affected by the drought. In addition, nonfood aid in the 1970s and 1980s was often incompatible with pastoral livelihoods. The rebellions of the 1990s in Mali and Niger and on-and-off civil wars in Sudan and Chad have also created a fragmentation of projects and NGO presence. NGOs that are interested in improving living conditions of large numbers of Africans are likely to withdraw from areas such as these for not only security reasons but to devote their limited resources to areas where personnel, funds, and resources produce greater results. 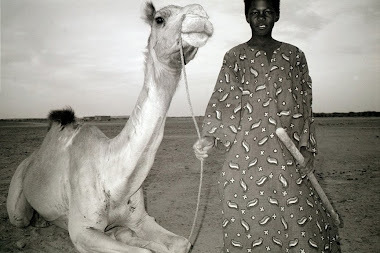 Pastoralists are no strangers to this experience, as NGOs have come in and out of their territories for over 40 years. So from a pastoralist perspective, to cull their herds even when prices are subsidized by NGOs and government agencies is a greater risk than enduring the latest drought. Most choose instead to migrate large distances for pasture and water, stretch out their food supplies, and work laboriously to maintain the health of their animals. To sell their animals, while it may provide the money needed to buy staple food products, creates a situation of greater vulnerability to the drought if it continues, or to non-related climatic events like banditry, disease and accidents claiming the remainder of their herds. It is unfortunate what is happening in the central and eastern Sahel (IRIN News, “Mali: Pockets of Extreme Vulnerability Still Persist” http://www.irinnews.org/Report.aspx?ReportID=90522). This is not the first time, however, that Sahelian countries have endured chronic drought and long periods of desiccation. In the past 100 years, drought affected the interior of West Africa during 1911-1914, 1927-1928, 1931-1932, 1940-1941, 1968-1974, 1983-1985, 2005 and now in 2010. The Russian and Levant droughts and other extremities like the floods in Pakistan this year are signs of an approaching change in climatic events in areas like Sub-Saharan Africa, the Middle East and South Asia. A question remains if these and the regions within them are prepared for the demographic changes that will accompany such extreme shifts in climate. The Sahel is not. Sahelian communities have lived with vulnerability in both good and bad years for decades. The article mentioned above is reporting on an immediate crisis and not on the chronic problems that have manifested into a long-term susceptibility to food shortages, malnutrition and famine. In the realm of academia Michael Watts’s book, “Silent Violence” and Alex de Waal’s work in the Sudan have showed the factors (both internal and external) that manifest into debt and dependency during good times and later exacerbate a crisis like food shortages and famines when natural or man-made disasters strike. In my reading of the IRIN news story I found points that omit information and need addressing, not just by spectators (like I am for the moment) but by policy makers and aid workers on the ground in the Sahel. First, the above citied article makes an assumption that pastoral groups can subsist on the milk of their animals for an undefined period as long as pasture is adequate. This may hold true for part of the year, but to subsist exclusively on milk is a practice only able-bodied adults can manage for moderate periods. In pastoral societies, adults who are fit enough will live exclusively off of milk: ranging from a few weeks to extreme cases of five months out of the year. Malnutrition will become evident first in children and later in others the longer grain products are unobtainable. Pastoralists have always had a dependency on neighboring agricultural communities and any retardation of rice, millet and sorghum harvests affects their food security. Second, the article talks of “…extreme stress as the preharvest lean season continues,” when discussing sedentary, farming communities. Periods of stress exist for all groups dependent on natural resources each year but their ‘lean seasons’ are usually not identical. 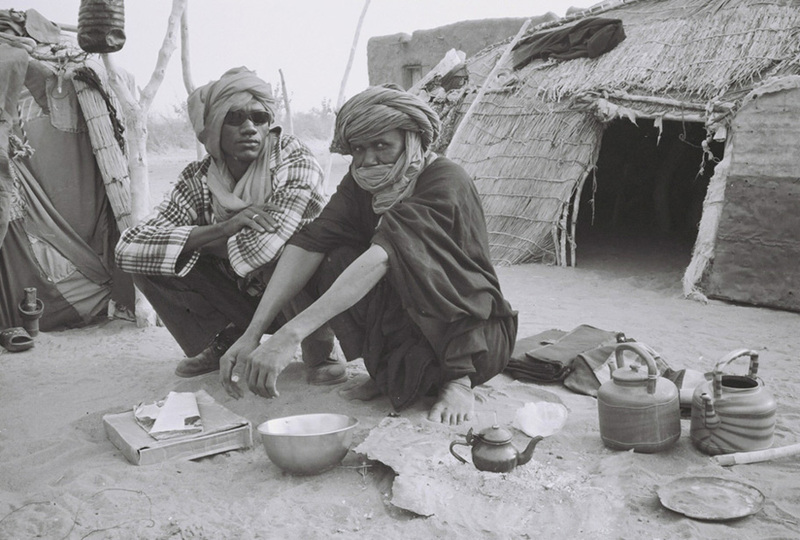 Generally for the northern Sahel farmers experience the hardest of times at the start of the cold season (September to November). It is when granaries are emptying and work is essential to ensure a successful harvest. 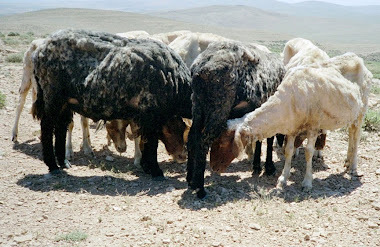 April through June is the saison soudure for pastoralists. This is the end of the hot-dry season when pasture is exhausted, an animal’s value drops significantly at the markets and drawing water from the wells becomes crucial and a contest for herd survival. Fisherman experience difficulties at the height of the rainy season (August-October) as catches are difficult and meager due to the recharging of rivers and other large bodies of water. Third, the article acknowledges the efforts the Malian government and aid agencies are making to subsidize grain prices but omits the constant competition between local grain production and the imported staples and aid that is dumped on African markets in good years and times of crises (see a previous blog here entitled, “Food Aid Convention [FAC] in Madrid, Spain,” posted February 02, 2009). The consequence of importing grain which is encouraged by agencies like the International Grains Council is the retardation of local food production. Since farmers have to compete with imports the incentive for them and their children is not to continue farming but to seek out other income opportunities. The younger generations are not well represented among the local food producers in Tombouctou, Gao and Kidal (the three provincial towns mentioned in the article) and who can blame them? They migrate to urban environments at home or abroad and enter into wage-labor opportunities that at first are lucrative but are dependent on a booming global economy. Problem: we have been in a global recession since 2008. In fact, Mali was one of the first countries to experience spikes in unemployment. Thus the subsidized prices, while a blessing to some, will only be an insult to young people who are out of work and struggling to return to their families to assist them in raising and harvesting the crops by December. Fourth and perhaps the greatest tragedy, is urgency the article makes to find seasonal or temporary employment opportunities for agro-pastoralists living along or near the Niger River without any mention as to what type of work. To offer agro-pastoralists work opportunities like what their counterparts found in the urban environments is the same dependency treadmill that has brought Mali once again to the brinks of a food crisis. The global economy will continue to go through boom and bust cycles and when they are abandoned once more the effects of neglected local food production will be evident. In my opinion this is an excellent time for Mali and other Sahelian nations to use these labor pools to develop water infrastructure so that river water, ground water and temporary sources can be utilized in local food production. It is a chance to improve roads so food transport costs drop. The government and aid agencies need to pool their resources in order to offer wages, food and other incentives to these vulnerable groups to improve such infrastructures. It is a chance for these intelligent young people who lost their jobs in France, Bamako and Abidjan to return to Tombouctou, Gao and Kidal and apply their skills at tillage, pest management, and nutrient management. To offer locals a participatory role in improving local natural resources is a vital step in promoting food security. In conclusion given the extremities in climate change happening across the globe, this article will likely reappear in the near future with a different title, a different set of people interviewed, but the same underlying message, “The Sahel needs help!” This is a true statement but the omission of long-term factors that amplified this vulnerability does not expedite a solution. It only perpetuates the story of Africans victims of their climate when in truth they are constrained by political, social and economic forces that retard local food production. Food producers, whether they are farmers, herders or fishermen experience tough times, be they seasonal or generational, but this does not mean they must abandon what independence they have for towns, wage labor, and imported foodstuffs. Subsidizing food prices and distributing food aid has its place but to constantly commit to this in ‘bad times’ and ignore the systematic problems occurring even when the rains are adequate is an injustice. New work opportunities should be directed at projects that encourage local food production and not directly and indirectly promote the importation of food. To bring back incentives for local farmers to produce will have ripple effects regarding reductions in illegal immigration and proper stewardship over natural resource management. Committing to a gradual withdrawal of grain imports on Africa’s markets will help but policy makers also must simultaneously encourage the local production of agriculture, animal husbandry and fishing. To empower a local food producer in Africa is to take a healthy direction in long-term food security. With famine again threatening the Sahel region, the same time-worn and flawed responses to the looming crisis appear to be in the making. According to Nigerien government (IRIN news reporting), 50% of its population (7 million) at risk of famine in its central and eastern parts and Chad is reporting 20% (2 million) are at the same levels of vulnerability in the central and northern parts of its territory. 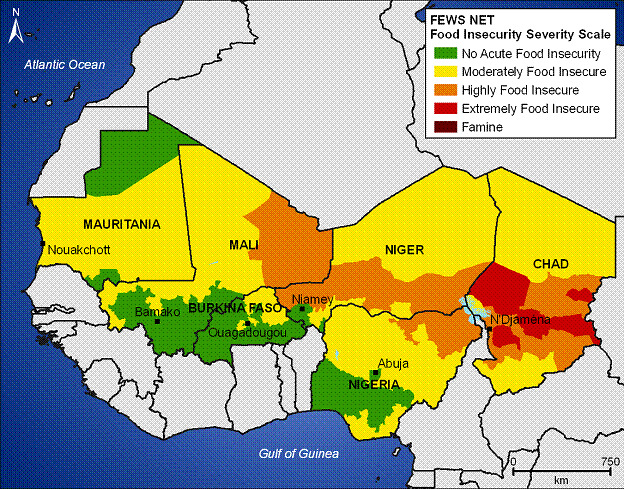 Updates from FEWS (Famine Early Warning Systems) verifies these reports as a belt of high to extreme food insecurity stretches from eastern Mali to western Sudan (see the image above). The media interviews officials at national agencies in an effort to find solutions. These officials urge NGOs and wealthy nations to provide immediate food aid and long-term assistance to their agricultural, livestock and irrigation sectors. Once again by thinking ‘inside the box,’ expectations rest on the central government to be the gatekeeper and manager of external aid as was the case with the droughts and famines of the 1970s and 1980s. This reliance on external donations and national governments to individually manage their own food crises accomplishes little to end food insecurity in the region, however. Solutions are obviously not easy or immediate. But there are two realities that are under reported and need greater attention. One is the growing conditions of regional climate change and how this will affect the area. With greater extremities of weather, particularly drought and flooding, land use and migration patterns will need greater flexibility and promotion by West African states. Regional opportunities for temporary work and migration to bordering states are needed to allow vulnerable groups to stave off future crises. This is a tactic that local populations, particularly nomadic pastoralists, adjusted for in the past but the creation of arbitrary borders and confinement of populations through border closures and discrimination have retarded the fluidity that West Africans once engaged in to feed their families and maintain their livelihoods. The other is allowing local populations to manage their natural resources. The policy of decentralization is promoted by many international actors including non-governmental organizations, bilateral and multilateral agencies. Decentralization is the process of the central state transferring various powers of development and natural resource management to local communities. Most West African states have balked on passing decision making powers and releasing the needed funds for development projects to the local level. There are obviously concerns over defining representatives and dividing powers fairly among two or more groups who share the same natural resource(s). These concerns are not justification for dismissing the goal of decentralization, however. Central governments in the Sahel have made few steps towards overcoming these obstacles and implementing decentralization in the region. Where the national level can have a participatory role in ending food insecurity is in eradicating laws relating to food production that conflict and cancel out one another and eliminate the competition that exists between different bureaus. In addition, Sahelian governments must promote agendas that maintain natural resources and are complimentary to stable food production. To do so, the central government will have to play a pragmatic arbiter to the diverse populations it represents instead of heavy-handed patriarch. The stalemate of the national government overseeing and controlling natural resources while maintaining a top-down approach to development is not working to improve agriculture, steward pasture and manage water resources. Even if the food aid arrives delivery will be late as much as five months in the more remote Sahel. Crops have already failed, livestock is dying, seed banks are empty, and pasture is depleted. The region has prolonged its risk of food insecurity for too long by relying on the central government to solve this issue. There must be greater cooperation not only at the national level but also the regional and local. Giving West Africans a significant stake in the land they inhabit is the first step.